This 36ft, 3 slide outs fifth wheel toy hailer by KZ has everything you need for a great weekend. 12ft cargo area with an optional sit and sleep bed system. Walk through the cargo area and into the main living area; two opposing slides out make for an open feel with Theater Seats and dinette in one and the kitchen/ entertainment center in the other. This unit has an 8cu ft RV Refrigerator, 3 burner cooktop and island sink. Up the steps to your left is the bathroom, with a corner glass shower, foot flush toilet along with walk around space to the bedroom. The master bedroom has a queen size bed, closed on each side and a wardrobe slide out. The KZ Sportsmen Sportster 363TH12 Fifth wheel is a 4 season, all aluminum built unit. 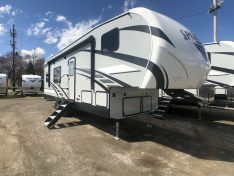 On the outside of this coach, there is a full outside kitchen, 18ft power awning along with an option for an additional 9’ awning. 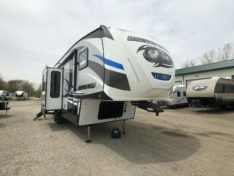 Contact Tri City RV Sales team today for more information on KZ Sportsman Sportster toy haulers.